<Corin> I didn’t say I’d make it! <Corin> I’ll do it for 31. <Corin> It’s been too long since I’ve seen 29-30. <Corin> No complaining about my laziness? More literal translations of the jokes can be found in the script alongside the ones we used. Just comment them out and you’ll literally have your literal jokes in the subs. 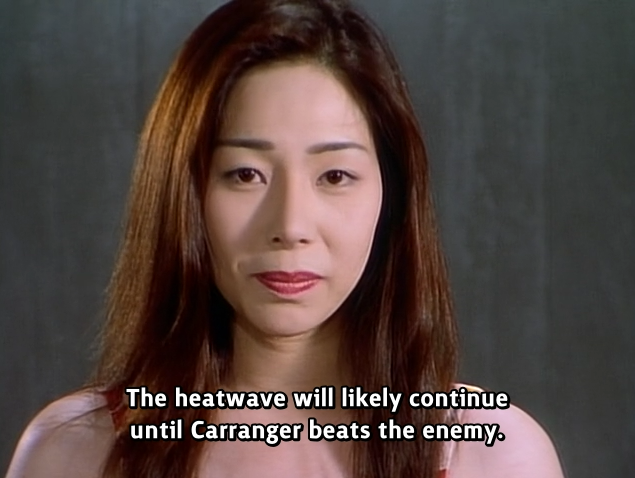 So here’s some more Carranger again. We know it’s been a really long time since the previous ep and we apologize for that. We just had a hard time finding some replacement staff that were up to snuff for the project and probably should’ve cut off someone from the project earlier. We’re not the kind of group to go “YOU’RE A WEEK LATE!? FIRED!” but we realize the wait so far has been too long. But now that Corin has joined the team as editor we’re good to go for more Cat releases. I’d also like to add that while we don’t really mind people asking about the status of Carranger please do keep it on-topic. Your reply will be ignored all the same if it’s posted to a Carranger post as one that’s posted to another random release. I’ve not really bothered deleting any off-topic posts but I might in the future if it gets annoying (it hopefully won’t be needed though). That’s not to say your comments will not be read but unless it’s an interesting question/remark it’ll most likely not be replied to. If we have a status update we’ll post it on the blog rather than in a comment!